The first time I heard someone mention Treasure Island I assumed they must be talking about a pirateesque theme park. Luckily before I embarrassed myself by actually verbalising this (that’s that out the window then!) I found out that it’s a real live place! I know right, grown-ups actually called a legitimate piece of land Treasure Island! It sits pretty much in the middle of the San Francisco bay, and is joined to the mainland on both sides by the Bay Bridge. Anyway, once I found out that it wasn’t a theme park I was more than intrigued. Then I found out that EyeEm* were holding one of their bi-annual global meet ups on the Island, with the chance to get some behind the scenes access! Needless to say, I jumped at the chance to visit. the island is completely man made. it was named Treasure Island because it was rumoured that the silt and rock it was made from contained gold – though no one has actually ever found any! it was built for, and played host to the 1939 World’s Fair. after the World’s Fair the plan was for TI to be used by Pan Am for its flying boats or ‘Clippers’. it was due to become San Francisco International Airport before it became a naval base in 1942.
it has been used to film numerous films including Indiana Jones and the Last Crusade and Flubber. it has recently become an official part of the City of San Francisco and is about to undergo huge redevelopment. …so not quite the highly dramatic and turbulent history I had imagined! Our first stop was building 1. A massive horseshoe shaped structure which was being set-up for a very elaborate nautical themed wedding complete with six larger than life model seals, a rowing boat and a 12 foot high lighthouse! It turns out building 1 was originally intended as the Pan Am Airways terminal, after the World’s Fair ended. It’s absolutely enormous with beautiful art deco features but dominating the interior is a, slightly odd, mural that spans the entire width of the building, which depicts the naval history of the pacific since 1813 and into the future. It seems such a bizarre addition to an otherwise architecturally impressive building but, they seemed pretty proud of it so, who am I to judge. Grateful for the chance to escape the staring eyes of the mural we scuttled onwards and down through a maze of underground corridors – very much what I imagine a nuclear bunker might look like! Now for those that don’t know I’m a bit of a geek when it comes to history – one of my favourite places in London is the Imperial War Museum – so I found the idea of the next part of our visit rather thrilling. We were invited to see some of the museums archives and spent just over an hour checking out some of the pieces in their collection. There were some interesting things but I guess I couldn’t help but compare them to the collections I’ve been fortunate to see at other museums, and if I’m honest I guess they fell a little short for me (controversial!). I do realise my comparison is pretty unfair though given the support and funding available for both. 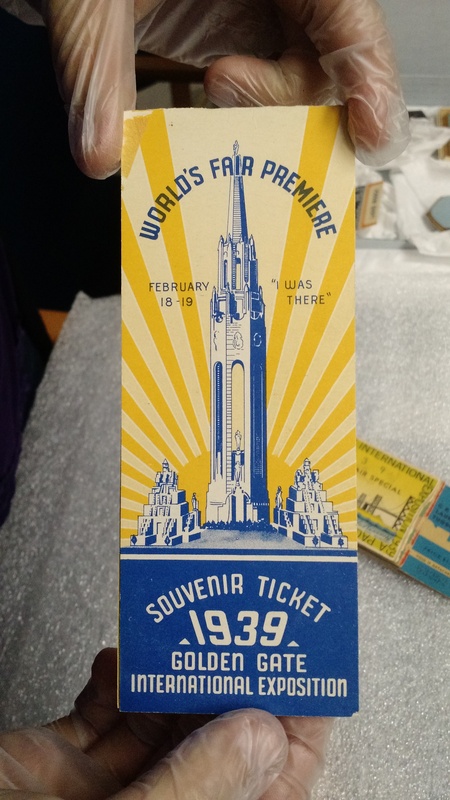 That said some of the printed stuff from the World’s Fair was pretty cool. 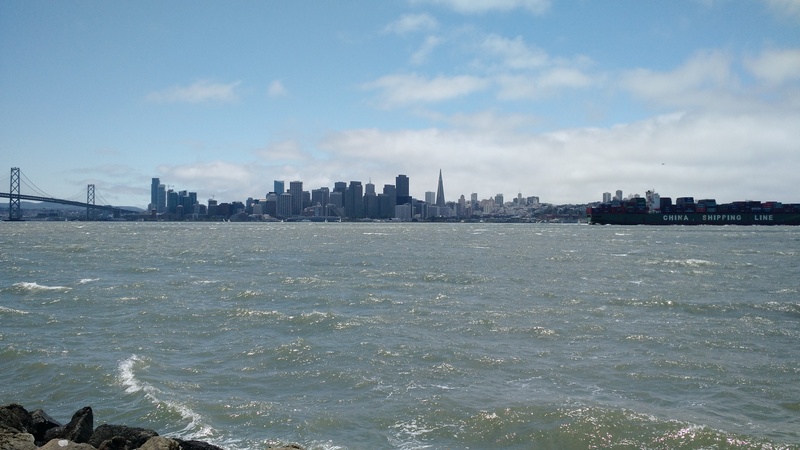 We surfaced, in desperate need for fresh air and stopped to admire the view over towards San Francisco. We were very lucky it was such a clear day because, as far as a view of the city goes, it doesn’t get much better than this one! My first and I suppose lasting impression of Treasure Island, the parts that we were able to see anyway, was that it looked and felt like an elaborate set from the The Walking Dead (my current Netflix obsession). There was a distinct feeling that the place had been abandoned, that every living being had perished or had ‘turned’, and was lurking ready to sink their teeth in to the back of my neck….ha! No but seriously, I’m interested to see how it’s redevelopment pans out and hoping that they make it a bit more visitor friendly, whilst making sure the people that actually live there aren’t ousted as a result! I am also looking forward to returning for the legendary flea market, a cheeky wine tasting or two at one of it’s urban wineries…and who knows, maybe even a large nautical themed wedding! *EyeEm is a photography community and platform. A place for photographers of all abilities to share, interact, and learn more about taking pictures on any device. EyeEm’s photo Missions and partnerships allow photographers to showcase their original works around particular subject matter. In four years of living here the only time I’ve been to Treasure Island we got out of the car, said ‘oh it’s very windy here’, got back in and continued to drive over the bridge. So thanks Jane, I was very glad to get the skinny on TI and be able to talk knowledgeably about it to our visitors, without ever having to actually go back!